Ride down a twisting slide at one of Milwaukee's water parks. Located in the southeastern corner of Wisconsin state, Milwaukee and its surrounding metro areas is famous its professional sports teams, brewing companies, and ethnic neighborhoods with small shops and eateries. Travelers to the Milwaukee area can enjoy a tropical atmosphere no matter the weather by visiting a local indoor water park. For a day of aquatic activities, guests to the area can choose from several indoor water parks in Milwaukee. The Paradise Landing Indoor Water Park is in the Hilton Milwaukee City Center and offers travelers a year-round tropical getaway. 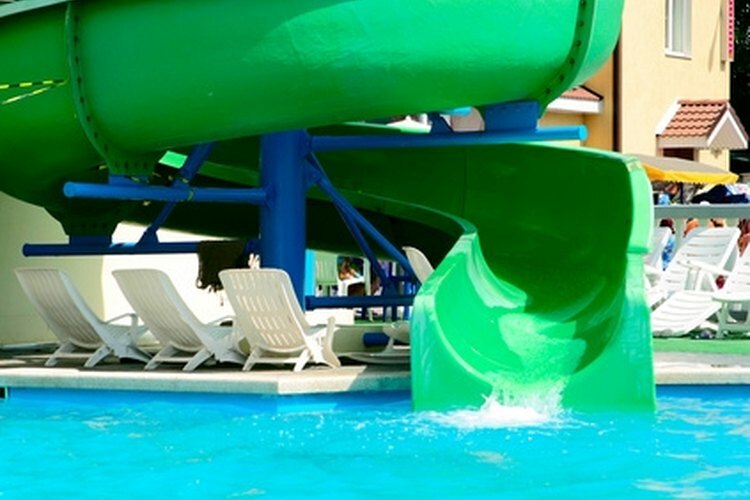 A three-story Jamaican Village with four water slides, lagoon, boat slide, seashell slide, frog slide, turtle squirt, water canons, and mushroom rain drop fountain are among the various water attractions at this 20,000 square water park. You can also test your luck at a variety of video, table and arcade games at the resort, or enjoy a bite to eat at the park's Cabana Cove snack bar. While children frolic in one of the resort's many pools, adults can relax in the hydro-therapy spa while the tropical sounds of steel drums and reggae bands plays in the background. The Holiday Inn Express at the Milwaukee Airport is home to the Puddle Jumper Lagoon indoor water playground. Located close to Milwaukee's General Mitchell International Airport, this small indoor water park hotel is a convenient, smoke-free facility perfect for traveling families with young children. The water park offers an indoor playground 6,000 square feet in size where children can play in the splash pool and the kiddie play structure. Children of all ages can take a ride down one of two twisting water slides, or play in the park's water fountains and waterfalls. Adults may prefer a dip in the park's relaxing whirlpool, or exercising in the hotel's fitness center. Waukesha is home to the Country Springs Hotel and Springs Water Park. Just 20 minutes west of Milwaukee, the water park is 45,000 square feet in size and offers a variety of aquatic attractions for both adults and children. The indoor water park features a three-person boat ride, kiddy pool, water basketball play area and video game arcade. Guests seeking a more relaxing experience can drift along the lazy Barrel Roll River or revive their muscles in the indoor or outdoor hot tub. The Waukesha Waterworks playground provides entertainment for children including a 600-gallon tipping bucket, water cannons, and kiddy slides. If these aquatic attractions are not enough, guests can also enjoy a variety of sandwiches, beverages, burgers, fresh fruit and pizza in the park's Square Meal Snack Bar.